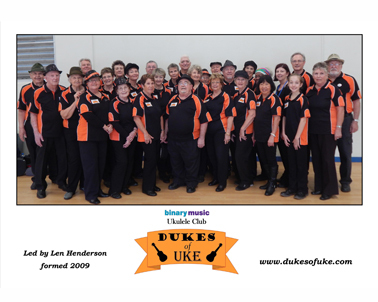 The Dukes of Uke is a ukulele club based in the Cleveland area which was formed in 2009 to enable anyone with an interest in the ukulele to sing and strum some of their favourite music together. They play songs from the 50’s to now — everything from jazz standards to motown hits. Catchy riffs, harmonies and melodies characterise their performances of their favourite songs, accompanied on a range of soprano to tenor ukes, with u-bass holding it all together. They’ll get the crowd tapping, strumming and singing along with popular jam songs at the end of the set.